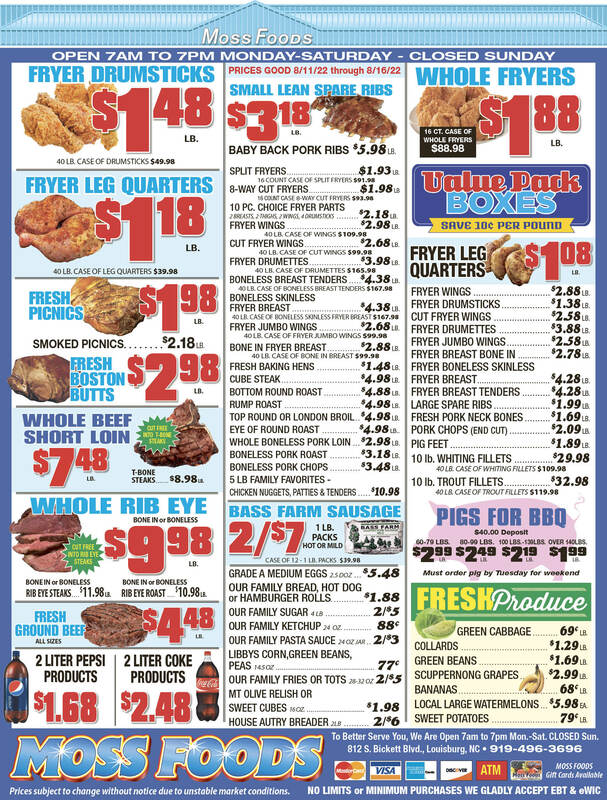 Showing 40 articles from October 1, 2014. 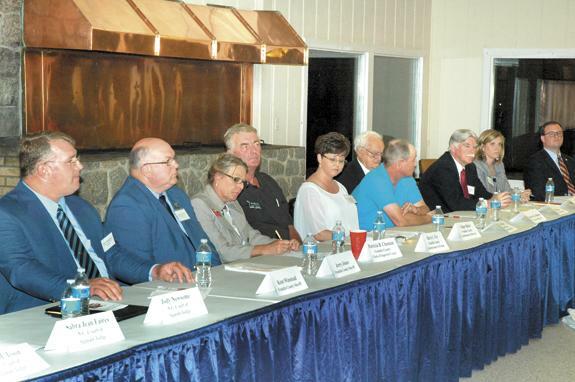 LAKE ROYALE -- Sheriff Jerry Jones and his challenger, Kent Winstead, sat side by side Monday evening, essentially in the middle of a long table, joined by federal, state and other local candidates taking part in a public forum. Their proximity and location seemed fitting because their race for the county's top law enforcement post was the center of attention. 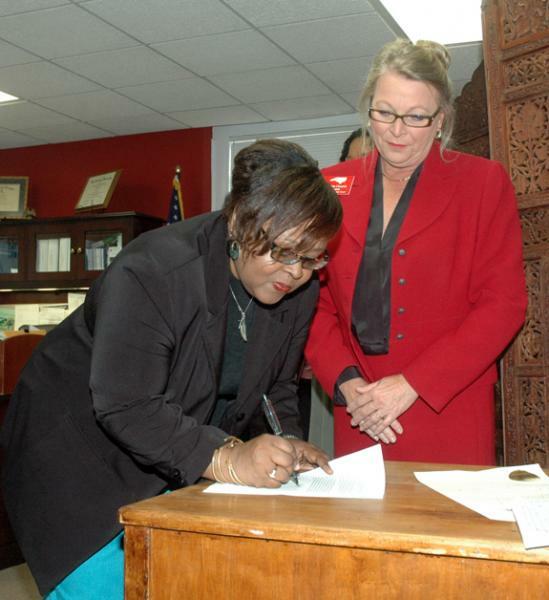 LOUISBURG -- History was made inside the Clerk of Courts office this week. And, for a woman with few words, Annette Henderson worked hard to pick the right ones to say after being sworn is as the office's newest assistant clerk of superior court -- becoming the first African American in the county's history to hold the title. 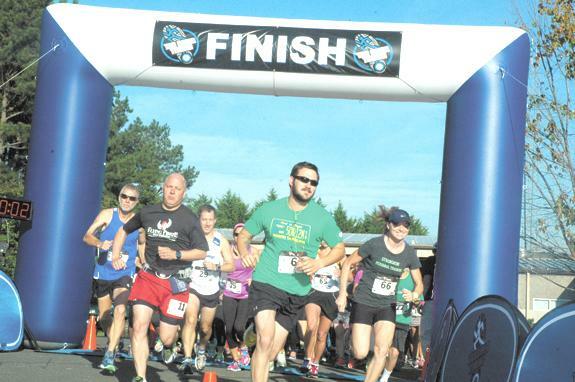 YOUNGSVILLE -- Standing at the doorway of the Youngsville Fire House, former Mayor Sam Hardwick was amazed by two sights -- a cluster of people getting ready for a morning run and a shimmering sun. Both, Hardwick figured, could be attributed to the enduring legacy of Jeff Fields -- an assistant fire chief until he died in December 2013. CULVER CITY, CALIF. -- A Louisburg native has run into a bit of good fortune. 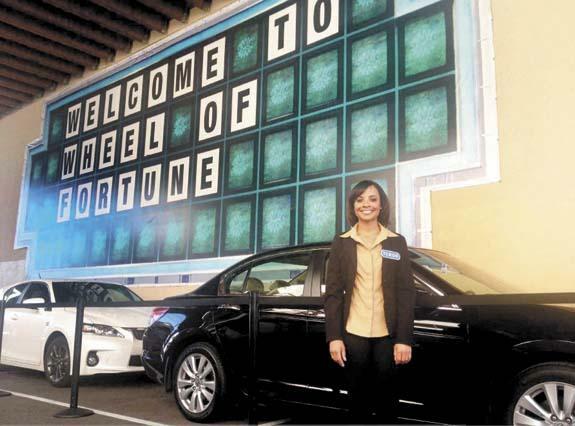 Tensie Taylor will join two other contestants on a Wheel of Fortune episode airing on Oct. 9. For the Louisburg High, NC State and University of Southern California graduate, the May 2 taping of the show and broadcast was a long time in the making. Thom Tillis wants to become your United States Senator and Chad Barefoot wants to remain your North Carolina State Senator. 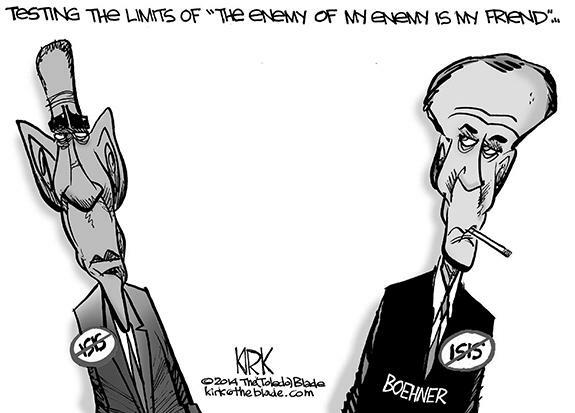 They share a problem; they cannot run on their records. Based on the slick, glossy and expensive mailers we keep getting, they have apparently decided on a strategy of distorting their records. They are both holding themselves out as champions of public education. Some stories are more important than others; I feel this is one of them. On Sept. 17, 2014, an intruder, 25-year-old Arron Eugene Cummings, was found in the Bunn North Carolina High School by a student or students. While there is a Bunn police officer, Timothy J. Trader, at the school, he was not aware of the intruder. Reports vary as to how long Cummings was physically in the school and the nature of what all his contacts with students or staff were. By now, I'm sure most or all of you have a general knowledge of the latest round of negotiations involving the town of Franklinton (TOF) and the Franklin County Commissioners a.k.a. the Franklin County Water & Sewer Authority (FCWASA). LOUISBURG --Amedeo "John" Gallo, 86, died Wednesday after-noon, Sept. 24, 2014 at his home. A funeral mass will be held 10 a.m. Saturday, Oct. 4, at Our Lady of the Rosary Roman Catholic Church. 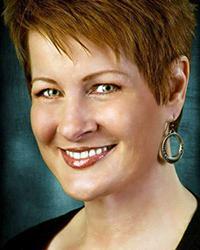 LOUISBURG - Cathy Gilliam Cantwell, 64, died Tuesday morning, Sept. 30, 2014. A memorial service will be held 11 a.m. Thursday, Oct. 2, in the chapel of Strickland Funeral Home. The family will receive friends immediately following the service. SURE TACKLE. Bunn High School defender Cordarius Bumpers (left) brings down Northampton County's Jaquez Hendricks during last Friday night's non-conference football game on the BHS campus. Bunn won the event by a convincing 70-0 margin. BUNN - After allowing a combined 87 points over their past two outings, the Bunn Wildcats weren't in a generous mood during last Friday's non-conference football showdown against Northampton County. 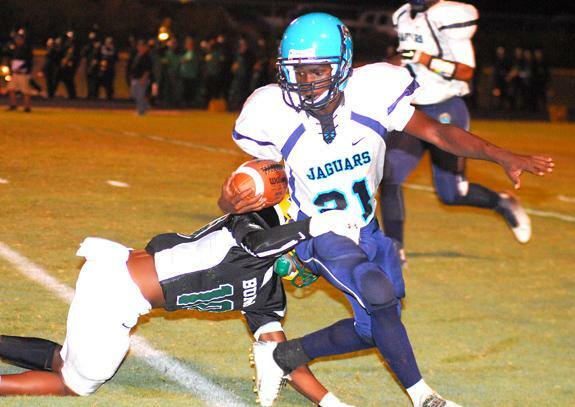 Instead, the Wildcats didn't allow the Jaguars to reach the end zone during a 70-0 rout at the BHS Football Field. Bunn, which will be off this week in preparation of its Northern Carolina Conference opener at Southern Vance on Oct. 10, is now 4-2 on the season. PULLEY'S PLAY. Franklinton's Mikaela Pulley (right) elevates for a tip while being defended by Louisburg's Summer Phillips during last Wedesday's high school volleyball matchup at the LHS Gymnasium. 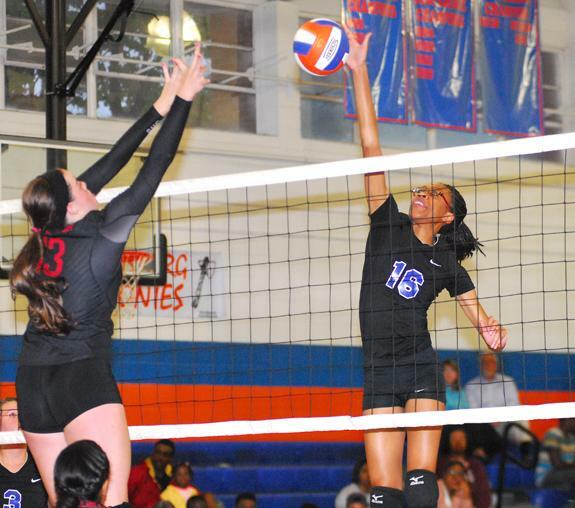 LOUISBURG -- In comes one, out goes another -- that's been the story to date this season for the Franklinton High School volleyball squad. 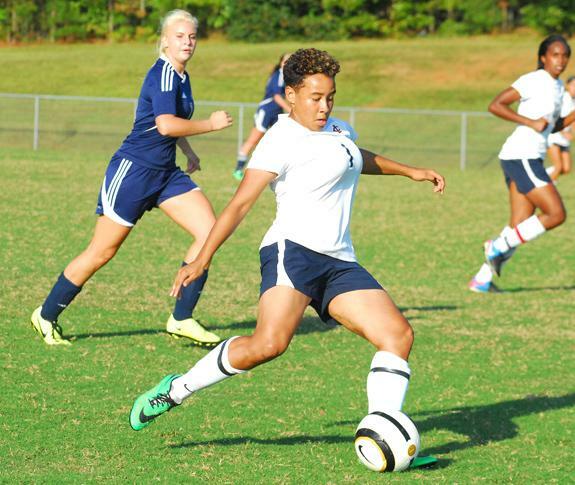 FHS head coach Crystal Barnes thought her club would be back and full strength -- and ready to make a run up the Northern Carolina Conference standings -- when senior standout Tiara Wilkins returned to the lineup two weeks ago following an absence due to an ankle injury. ALLISON'S UPWARD THINKING. 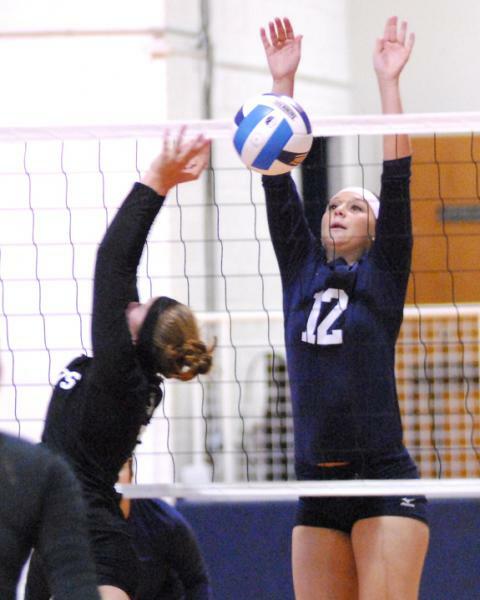 Louisburg College's Jennifer Allison (right) elevates for a block attempt during last Friday's home matchup with Surry CC. LOUISBURG -- A lack of consistency has been a key issue this season for the Louisburg College volleyball squad under first-year head coach Caitlin Withers. At times, the Lady Hurricanes appear to have the makings of a Region X powerhouse -- including the first set of last Friday's meeting with Surry as part of a tri-match at Taylor Center. 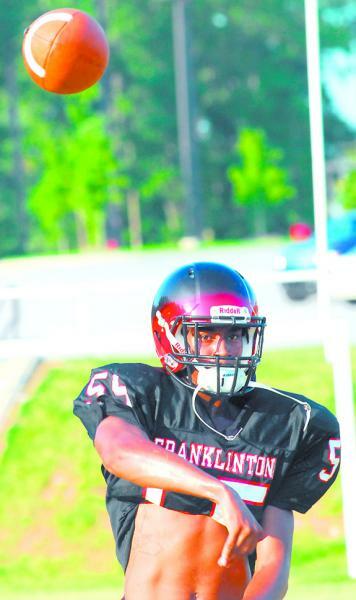 STEM -- With two high-powered offenses on display, it was expected that points could be plentiful during last Friday's non-conference gridiron meeting between Franklinton and host Granville Central. That's exactly what happened as FHS remained undefeated with a 51-42 victory over the Panthers. Franklinton is 5-0 heading into this Friday's expected challenge on the road against Corinth Holders. 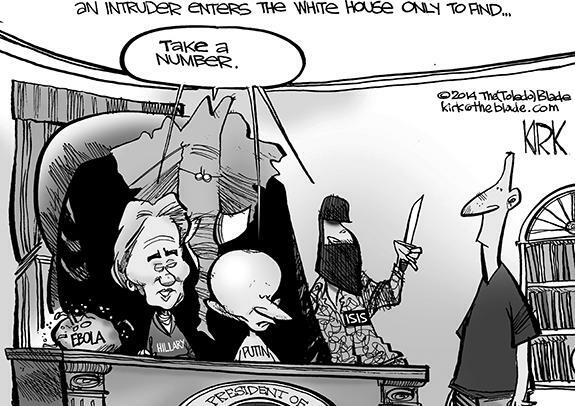 MEETING AT THE BALL. Louisburg College's Samantha Calvery (left) lunges toward possession beside a Wake Tech Community College player during Tuesday afternoon's Region X women's soccer match at Dr. Ronald May Field on the LC campus. 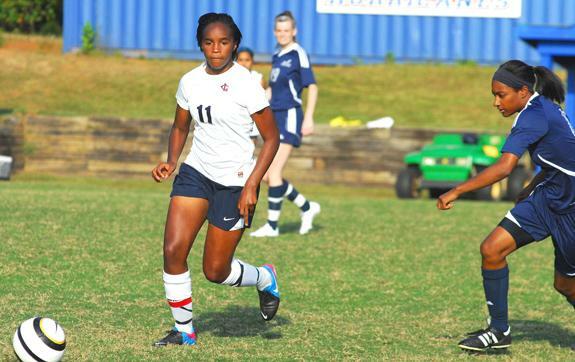 LOUISBURG -- Thirteen proved to be a lucky number Tuesday evening for the Louisburg College women's soccer team -- but the players weren't so fortunate at halftime. After a 45-minute performance that didn't meet Coach Andy Stokes' lofty expectations, the Lady Hurricanes were relegated to a fiery halftime speech from their veteran coach. ON A ROLL. 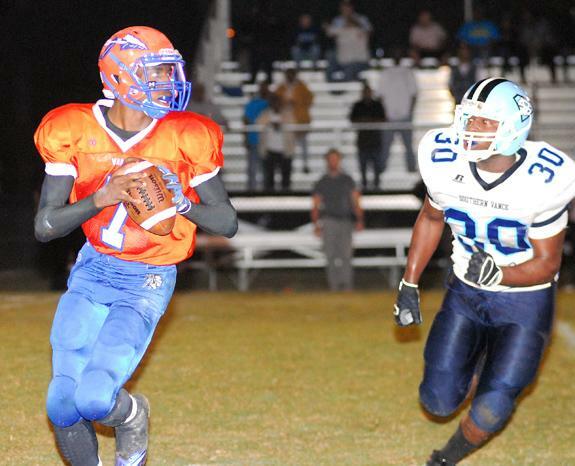 Louisburg High School quarterback Malik Sidibeh rolls out before completing a pass during last Friday night's home decision over Southern Vance. 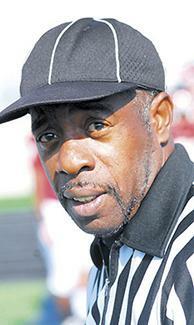 LOUISBURG -- Louisburg was concerned about Southern Vance's big-play capabilities heading into last Friday's non-league football contest -- even though the Runnin' Raiders entered the event with a winless record. But the Warriors came up with some huge plays of their own, including a key third-quarter touchdown pass from Malik Sidibeh to Ron Roberson that helped squelch some of the momentum Southern Vance had acquired. 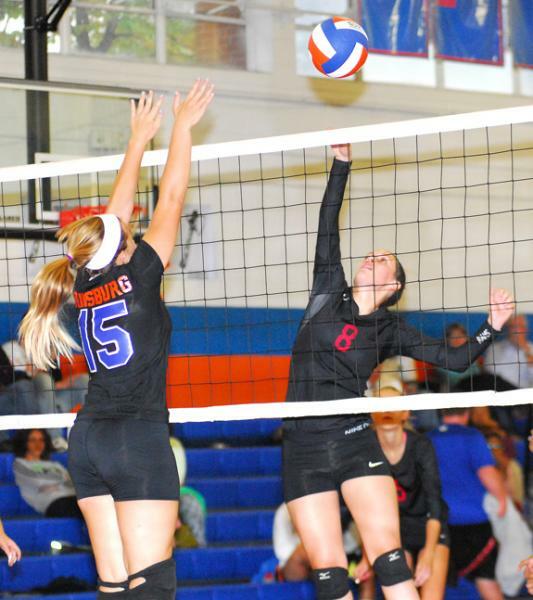 South Granville at Franklinton 7:30 p.m.
Southeast Halifax at Louisburg 7:30 p.m.
LOUISBURG -- The victories keep coming for the Louisburg Lady Warriors, who are currently undefeated in Tar-Roanoke Athletic Conference volleyball action. 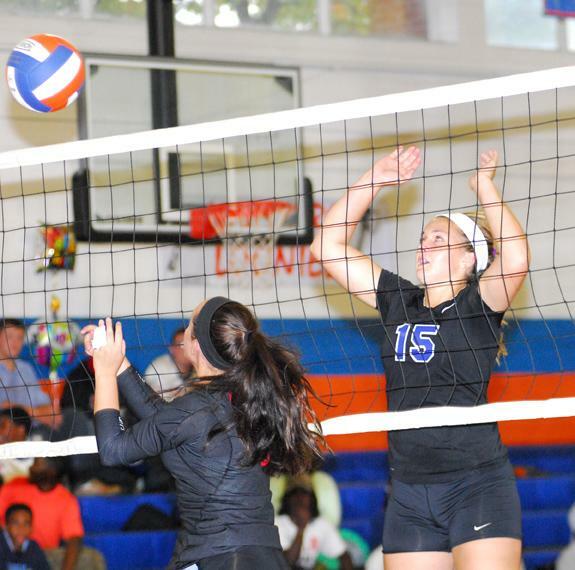 Tuesday evening, Louisburg rolled past KIPP Pride by a score of 25-3, 25-4, 25-6. The Lady Warriors are 16-3 overall. GREAT GRAB. 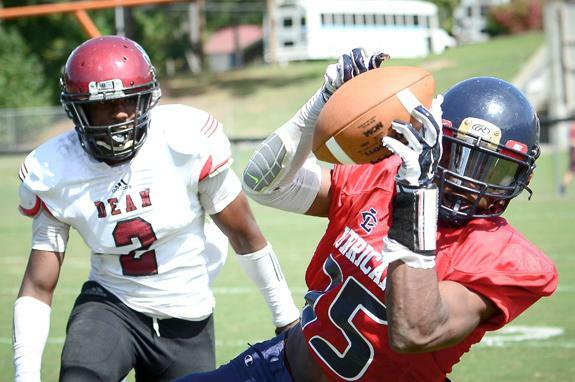 Louisburg College's David Miller comes up with a nice catch last Saturday against Dean. LOUISBURG -- Playing Dean has been no dream for the Louisburg College football squad -- and this season would prove to be no different. Throughout LC's time in the Northeast Conference, the Hurricanes have had their share of quirky meetings against Dean -- and the quirkiness usually results in a loss for Coach John Sala's club. RALEIGH -- Bunn High School alum Johnathan Alston had a strong performance for the North Carolina State University football squad during last Saturday's home loss to top-ranked Florida State at Carter-Finley Stadium. Alston, a sophomore, caught five passes for 54 yards, including a touchdown. The Wolfpack soared ahead early but saw the Seminoles eventually rally for a 56-41 decision. ZEBULON -- The Carolina Mudcats have announced a new, two-year player development contract with the Atlanta Braves. The 2015 season will mark the Braves' return to the Triangle for the first time in 18 years. The Mudcats were the Advanced-A affiliate of the Cleveland Indians the last three years. Fans at Five County Stadium were able to see a pair of first round picks and five players make their Major League debuts during that time. 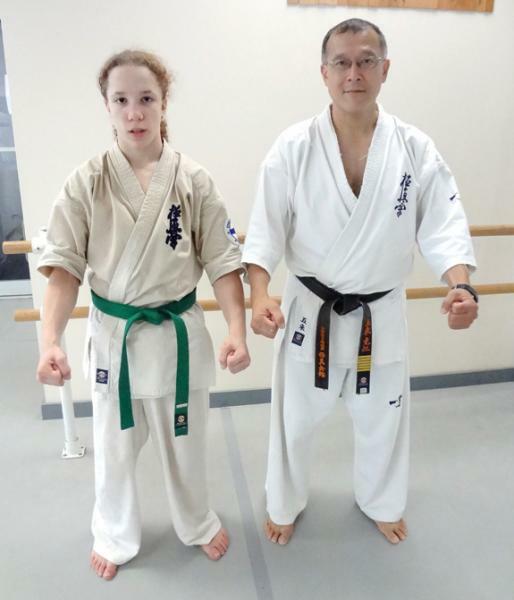 Christian Buffaloe, 14-year old local teen, was recently promoted the the rank of 2nd Kyu (Brown Belt) at the Kyokushin New York Headquarters School in Manhattan under the direction of Shihan Katsuhito Gorai (on right). Shihan Gorai is the U.S. Kyokushin Shibucho (Representative), originally from Tokyo. Christian resides in Warren County. Louisburg College freshman forward Carisa Jones delivers a goal for the Lady Hurricanes during Tuesday's home soccer victory over backyard rival Wake Tech CC. 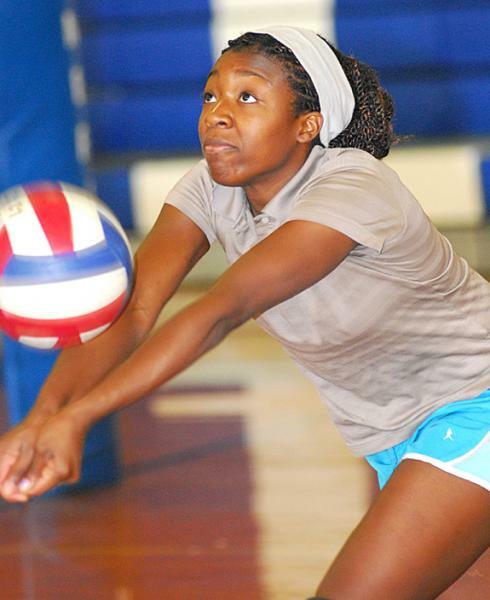 (L to R) Franklinton's Anna Moss and Vanisha Wilshire sky at the net during last Wednesday afternoon's high school volleyball contest at the LHS Gymnasium. Bunn High School senior running back T.J. Jones (with ball) breaks free on his way to a touchdown last Friday night against football rival Northampton County. 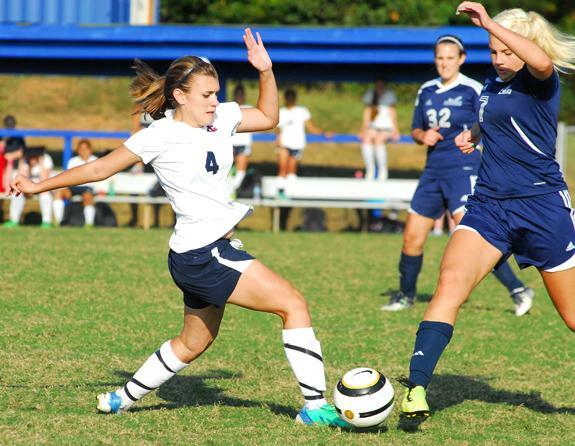 Sammy Rowland (left) from England is back for her second season as a high-scoring member of the Louisburg College women's soccer squad. Louisburg High School hitter Summer Phillips (right) enjoyed an effective performance last Wednesday evening against rival Franklinton. The engagement of Angel Reavis, daughter of Cindy Reavis and the late Tal Reavis of Youngsville, to Brad Homer, son of Jay and Lisa Homer of Columbia, S. C., is announced by the bride's mother. 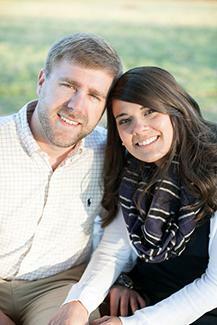 The wedding will take place on Dec. 13, 2014 at Harris Chapel Baptist Church in Youngsville. 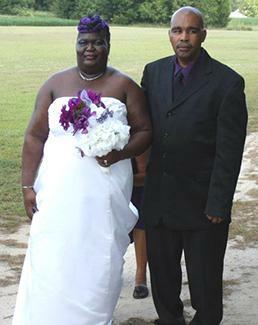 Gladys Marie Davis and James Lee Scott were married on Saturday, Aug. 30, 2014 during a 2 p.m. ceremony at Mitchiner's Grove Baptist Church, officiated by Pastor Melvin Jackson. The bride is the daughter of Mary Louise Horace of Franklinton and the late Sinclair Moses. The groom is the son of Nancy C. Scott and the late James Lee Scott Sr. of Enfield. 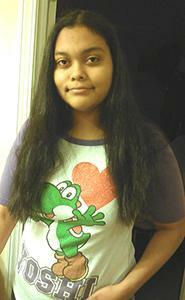 Ericka Smith of Louisburg was selected to participate in the 2014 Miss Pre-Teen Raleigh pageant competition that will take place on Saturday, Oct. 4. Ericka will be competing, for her share of thousands of dollars in prizes and specialty gifts that will be distributed to contestants. The National Society of High School Scholars (NSHSS) has announced that Bunn High School student Daniela Garcia of Louisburg has been selected to become a member of the NSHSS organization. The Society recognizes top scholars who have demonstrated outstanding leadership, scholarship, and community commitment. A central office administrator was among the new hires during a specially called Franklin County Board of Education meeting Monday night that focused entirely on personnel issues. Hired as the director for elementary education and federal programs was Stacy Stewart who will be stationed at the central office on West River Road. Franklin County has hired Carrie Neal of Moore County as assistant manager of financial services, a position previously known as director of general administration. Neal will serve as the county's finance director as well as assist the manager in capital planning, grant administration, budgeting, fiscal analysis and supervision of departments as assigned. The Franklin County Arts Council is hosting award-winning story teller and author, E. Gale Buck at today's (Oct. 2) Art Stroll in downtown Franklinton. Buck is well known for his association with Santa's Woodsmen, of which he is one. His first collection of stories, "Wanderings in Love and Devotion," was published in 1993. "The Woodsman's Tale, Share Your Life Without Expectation" was published in 2010, followed by two more collections of stories. Seniors know how to have fun! AT PLAY. 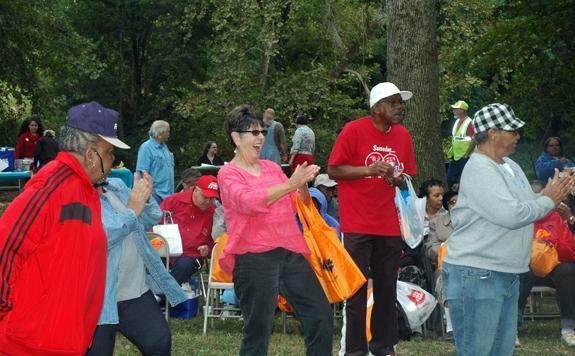 Above, Patsy Douglas, center, joins others in the Electric Slide, a popular party dance, during the annual Senior Fun Day at the Park in Louisburg last week. 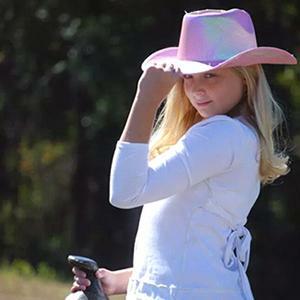 YOUNGSVILLE FALL FESTIVAL. 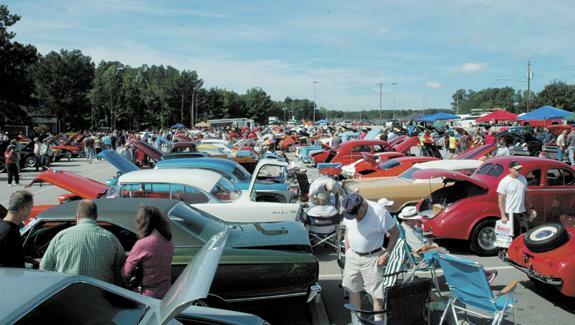 Car enthusiasts flocked to the car show that was part of last Saturday's Youngsville Fall Festival. It was a 50-year celebration of Ford's Mustang, that took place inside the Youngsville Elementary School parking lot. Franklin County Commissioners have approved a change order that increased the tab on the courthouse renovation project by almost $50,000. During the board's Sept. 15 meeting, staff and architects presented commissioners with a $49,980.76 change order to make repairs to the roof. DURHAM -- Steve Mobley's legacy in the Durham Farmers' Market was secured years ago, after having worked to transform it from a few booths inside a parking lot to a Southeast destination inside the Durham Central Park. 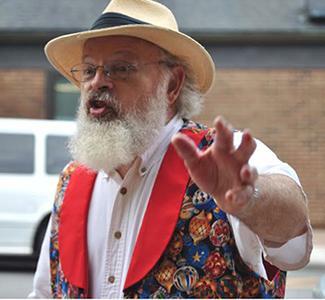 Mobley served as president of the Durham Farmers' Market board in 2012. 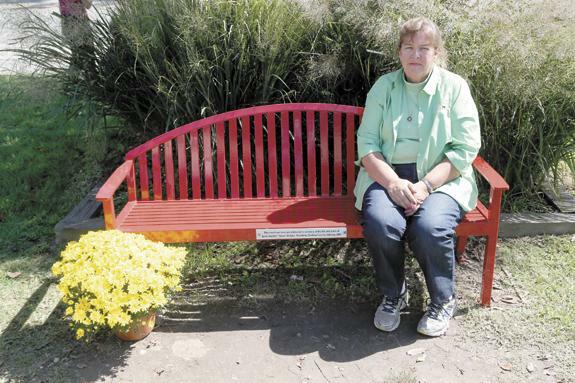 The Louisburg farmer died in August 2013.